Branded is a new series of events brought to you by Time Out Chicago and the people behind Revolution No. 9 New Years Eve with Justice. They aim to fuse the worlds of art, fashion, rock, hip hop, and electronic culture, and are kicking off the series with a show this Saturday night at the Congress Theater with a big line-up of some of the electronic world's finest. 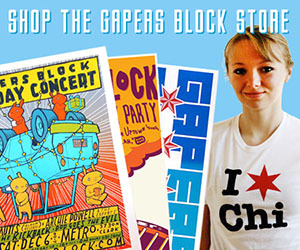 Graphic artist Dan Stiles will be creating limited edition posters, t-shirts, and skate decks for the show. Headlining the concert is Grammy-nominated Toronto electro DJ Deadmau5 (aka Joel Zimmerman). Expect an insane light show and a giant costume mouse head. Aside from taking the electronic world by storm, he's recently released a new iPhone application that allows users to remix their favorite Deadmau5 songs directly from their phone. 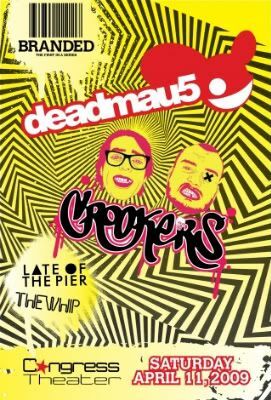 Also on the bill are international acts Crookers, Late of the Pier and The Whip. Local artists Zebo, Willy Joy, Loyal Divide, and Noise Floor Crew will be sharing the bill. Branded takes place Sunday night at the Congress Theater, 2135 N. Milwaukee Ave. Tickets are $21 and available to purchase online here, or at Gramaphone Records, 2843 N. Clark St, Silver Room, 1442 N. Milwaukee Ave, or the Congress box office. The show is 17+ and lasts from 8 pm to 3am. Ticket purchase includes a one-year subscription to Time Out Chicago. Really Quick Contest! We're giving away 2 pairs of tickets to the show, courtesy of the good folks with Loyal Divide. 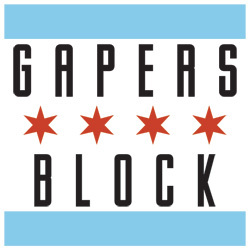 Just be the first 2 to email us at contests (at) gapersblock (dot) com with the subject "Branded!" and you'll be the winners! [Update!] We have our winners! Congrats to Michelle and Matthew!